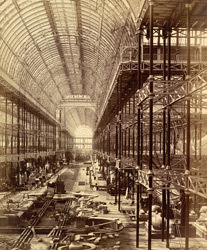 Construction work in progress at the nave of the Crystal Palace exhibition hall in Sydenham. Crystal Palace was designed by architect Joseph Paxton for the first universal fair held in Hyde Park in 1851. After the exhibition closed, the prefabricated building was dismantled and reconstructed in south-east London, 1852-1854. It was a milestone in the development of modern architecture for its innovative use of wrought iron and glass. It became a national centre of entertainment and enlightenment for the British public until it was destroyed by fire in 1936. British photographer P H Delamotte was commissioned to document the reconstruction for the Crystal Palace Art Union.